Film gate also called flash gate is very thin compare to another gate, this thin gate like film which have parallel runner before the gate, this type of gate used for straight edges. picture below shown film gate with main parts. 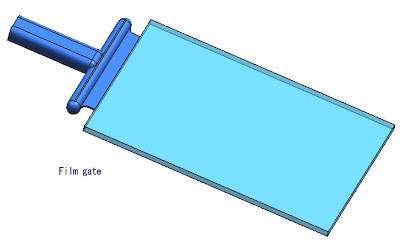 in generally this gate used in thin and flat requirement, like flat mobile phone cap, ipod cap and others. 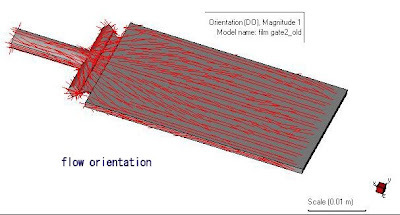 but sometimes this gate is not likely going to have a flat flow front, the make flow material more stable and flat, make temperature molds more higher than usual, but cycle time will also higher. recommended dimension is approximately 0.2 mm to 0.6 mm in thick, the land area (parallel runner) is also be kept small approximately 0.6 mm - 1 mm depend the large and weight of product. 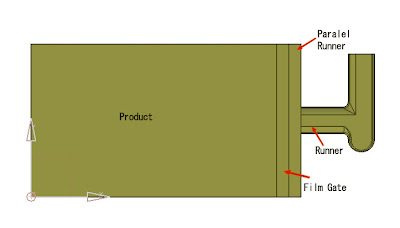 picture below shown other design of film gate, with more reliable and easy in process. look the different model of film gate, and different design of parallel runner. from the picture above we can choose the right place to make cooling pipe, the red color marks mean need more time to cool the product.